The longest day of the year, the summers solstice, or as PCT hikers call it “Hike Naked Day”. Thru-hikers would often be up in the high Sierras at this point where you don’t see roads or cars for hundreds of miles. I was crossing Muir Pass exactly a year ago. Today though I was a little closer to civilisation. I woke in a dry tent but there was mist in the air so I went back to the lake for a look, again worth the extra boot leather. I had planned to take route 102 down a narrow valley but found something much better. The Oirase Scenic Trail. Touted as “long distance” it is 14km of quite well maintained path beside and over a wide but shallow river with occasional waterfalls and rapids. It was a really pleasant surprise and I’ll be writing to Chris to make sure he takes that route if he goes to Lake Towada. Being a weekend there were more people about. Walking clubs with their Leki poles and checked shirts. Guided tours following ladies waving flags and a few people there just walking by themselves. I got a lot of stares but everyone of them turned in smiles and nods when I said “konichiwa”. When the trail ended I walked through the little town without noticing it and was out of food options. Then I saw a little stall with Fish-on-a-Stick and figured I should try everything. As it happened the fish is only on the stick while cooking. 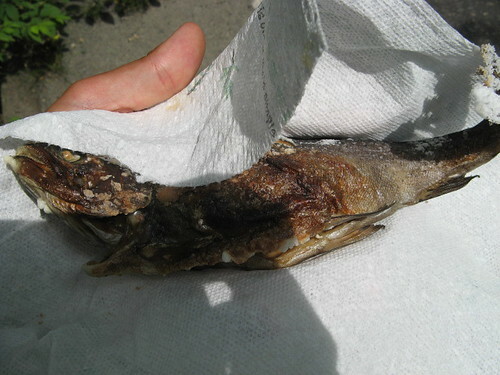 It is sold wrapped in a paper towel complete with scales, bones (cartilage?) and head. It was tricky but I managed to walk and de-bone the fish at the same time, it was really good fish and I bet it had some protein I’ve been missing. Today I saw 9 people of European descent. They were all in cars, whizzing about doing their own things. This is worth noting because I’ve not seen any non-Japanese people since Nagano more than two weeks ago. I guess Oirase is, quite rightly, mentioned in a few guidebooks. Another thing I haven’t seen for a while is my stove. I’ve been eating in ramen shops (or houses) or skipping dinner since Kiso Valley in May. It was almost an honour thing to prove I didn’t need it. But since I have it and pot noodles were on sale I decided to cook (boil some water) for a change. 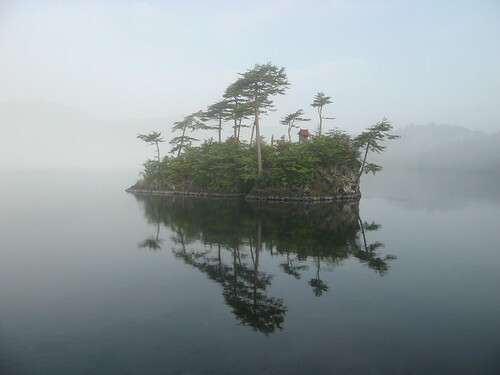 Photo of the island looks magical. This part of the country sounds all together more scenic. Hope you didn’t catch a cold! Hahaha! The increasing look of masked anxiety as you wander on to the road! How much of the day did you spend naked. Were the stares you received because you were naked? 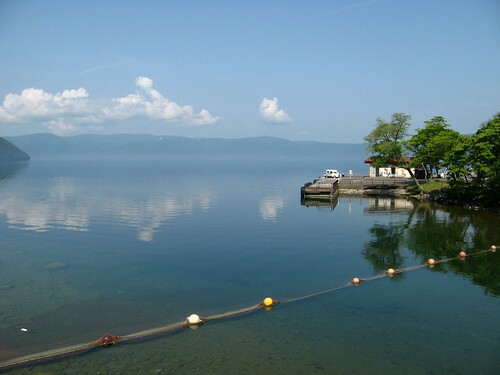 Oirase Gorge and Lake Towada are only 75 km away from, and VERY popular weekend destinations for, the people of Misawa Air Base. Misawa Air Base is a joint American-Japanese military base located (you guessed it) in Misawa. The Air Base is home to approximately 12,000 American military members and their dependents, including myself and my husband! It is very likely that the people of European descent you saw on your travels through Oirase were from the military base. 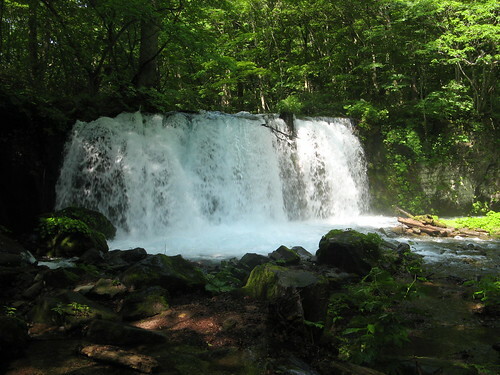 My husband and I vacationed in Oirase/Towada just this weekend, in fact. While we were traveling through the Gorge, we witnessed many Americans from the military base- more than we thought we would. So, it is my belief that many of the people you saw were probably also from the military base. So, if you did not already know this, perhaps it will enhance your future sightings of non-Japanese people in this Japanese island nation. Good luck with your travels! Itte irasshai! Thanks for the info. I’ll start looking out for the Y plates now. that really is a nice area to be stationed so close to. but then most of Japan is.